Some view the coral reefs as the underwater equivalent of a “rainforest” so to speak. Coral reefs serve to keep the balance of the ocean in check, act as both a haven and food source for marine life and a means of coastal protection during hurricanes. Additionally, the immense biodiversity of coral reefs is greatly beneficial to mankind, as it has intrinsic value not only to the environment but for tourism. Cayman’s dive industry recognizes the economic value our coral reefs bring to our islands and are keen to ensure the protection of our coral reefs to continue benefiting not only tourists but locals as well. In order to maintain a thriving economic value from our coral reefs, one must consider that negative environmental impacts can cause the economic value to depreciate. It is vital to maintain healthy coral reefs, not just from an environmental standpoint but also an economic one. Unfortunately, coral reefs are faced by multiple threats such as bleaching, overgrowth of algae and even the unfortunate event when an anchor ploughs into portions of the reef. Thankfully, Cayman’s reefs have been known to bounce back rather quickly when faced with bleaching. On the occasion of an anchoring mishap, there is a team of dedicated divers who work tremendously hard to help restore affected reef areas. Moreover, an innovative approach has been adopted to help assist with reef recovery and restoration. As of this year, Cayman Eco Divers received approval from the C.I. Department of Environment to begin their project of growing coral trees. They have since then joined forces with: Sunset House, Ocean Frontiers, Divetech, Central Caribbean Marine Institute (CCMI), Cayman Brac Shack and The Riviera all coming together to start growing coral trees in nurseries. Both Seas of Change and the Coral Restoration Foundation have been instrumental in the initial setup of the project and will continue to see the project through. In particular, Seas of Change have generously provided funding for this progressive form of reef conservation. Their commitment to assist with a project designed to both protect our oceanic environment and produce coral that will benefit existing coral reefs is admirable. 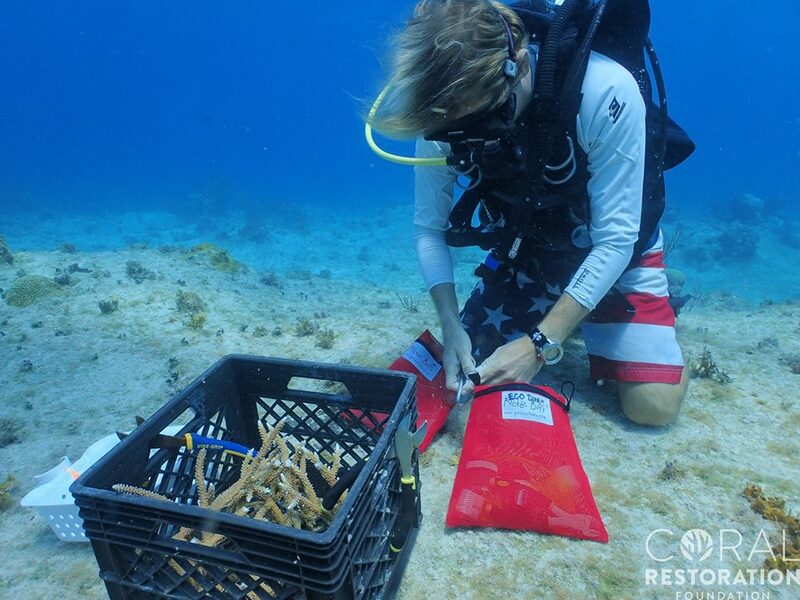 The Coral Restoration Foundation, plays a crucial role in this innovative project. Their expertise in successfully growing coral tree nurseries is key to the project thriving. 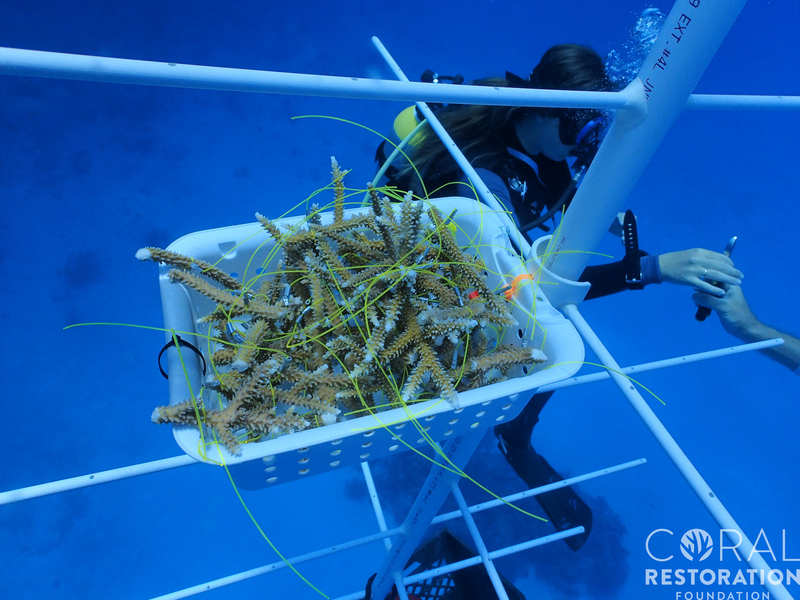 They have developed “effective strategies for protecting and restoring coral reefs” and their knowledge and experience has already proven to add great value to Cayman’s coral tree nurseries (Coral Restoration Foundation). Collectively, the mission of this admirable group of environmentalists is to help accelerate the recovery of existing coral reefs. Already the initiative has shown success in growing coral trees in nurseries. The idea is once the new pieces of coral reaches a healthy size it can then be planted on existing reefs. The aim is to spread out the new coral along damaged reefs to maximize the recovery of the coral reefs. As Aaron Hunt, from Cayman Eco Divers says, “You can’t just regrow a reef and you can’t just tear out a coral reef and replace it.” However, what we can do is utilize the coral trees grown from the nurseries to replenish existing coral reefs. By doing so, coral reefs can grow back stronger and flourish. Furthermore, by replanting new corals in close proximity to one another it allows the healthy strains of coral to create genetic diversity during spawning season. Currently, Staghorn coral is growing in the coral nurseries. It has the ability to grow rapidly in 6 months, producing multiple branches. These coral trees are then replanted onto existing reefs. Plus, Staghorn coral has the ability to reproduce through fragmentation, making it an excellent choice for a coral tree nursery. 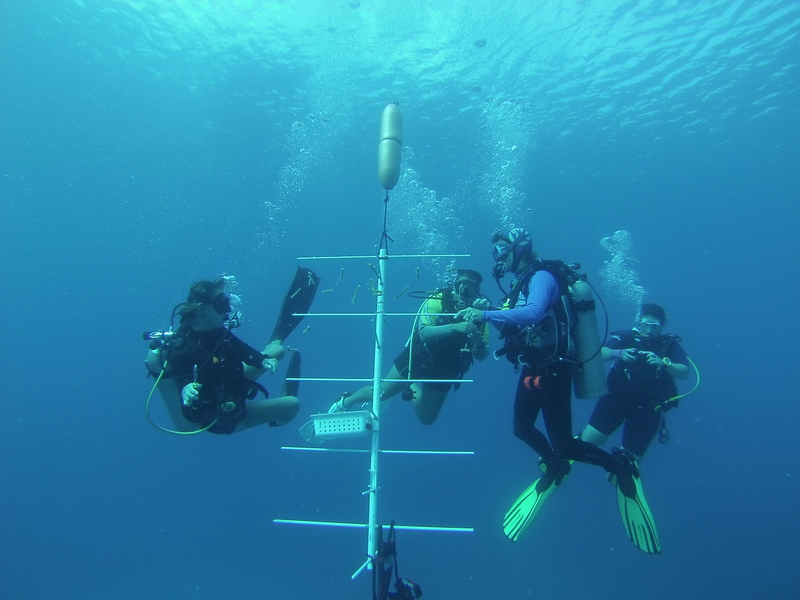 This innovative project to boost the recovery rate of affected coral reefs has a long term goal of providing a sustainable way to maintain healthy coral reefs. Likewise, this creative form of conservation can only benefit our healthy and flourishing coral reefs. Some may wonder, is there a difference between a coral tree and a reef ball? Yes, the coral trees and reef balls each serve a different purpose. Coral reef balls provide a different purpose in comparison to the coral tree, as they act as a place for coral to settle. Essentially, coral reef balls create an artificial reef. In contrast, the coral tree serves to add to an existing coral reef structure. Fragmented pieces of coral is able to grow in a coral nursery and then be replanted onto existing damaged coral reefs to assist in their recovery. Here in the Cayman Islands, since the inception of our tourism industry it has significantly been developed around our incredible coral reefs and dive sites. Our small islands, (Grand Cayman, Cayman Brac and Little Cayman) are lucky to be surrounded by some of the most unique and richly biodiverse coral reefs found in the world. Ergo, avid divers and snorkelers from all across the globe make the trek to our waters to discover for themselves the spectacular underwater landscape situated around our islands. Our beaches and coral reefs are the primary reason tourists visit our island. The Cayman Islands, like anywhere else in the world with coral reefs, have a moral obligation and responsibility to ensure that our reefs are protected and managed sustainably. This exciting coral tree nursery project is fundamental in allowing our islands to maintain a healthy eco-system in our waters. We are fortunate to have dedicated individuals working towards restoring damaged reef areas due to negative environmental impacts. Moreover, this thriving project will have a positive lasting effect on our coral reefs. Clarification…they are not growing “Coral trees” They are outgrowing coral fragments on structures known as coral trees. The Trees are constructed from PVC and fiberglass rods.The fragments grow into larger colonies and then are removed from the tree and outplanted onto the reef. http://www.coralrestoration.org/coral-tree-nursery/ At Ocean Frontiers they are growing Elkhorn and Fused Elkhorn as well as the Staghorn.